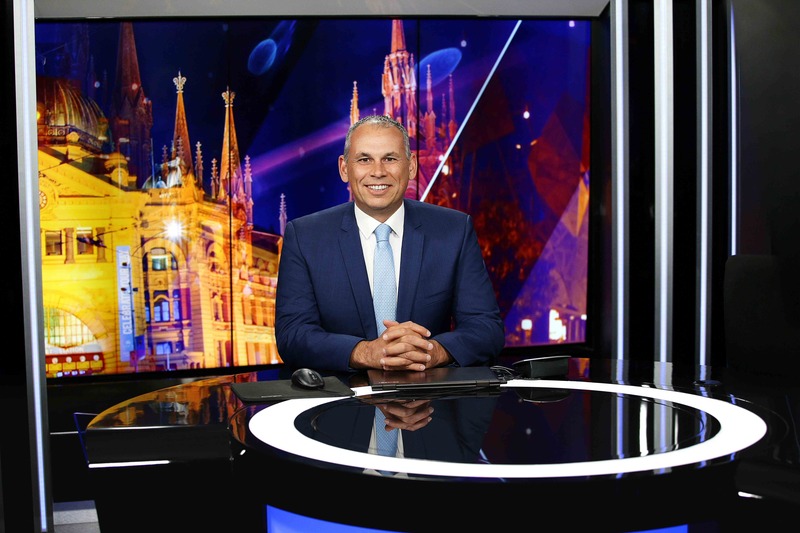 Sky News has put The Adam Giles Show in recess and appointed two new directors to manage the station’s weekend programming, following an interview with far-right nationalist Blair Cottrell on Sunday evening. The broadcaster, which aired an interview with Cottrell on its new show with former NT chief minister Adam Giles, described it as an “error of judgement”. Sky’s move to beef up the station’s weekend editorial team comes after its Sunday morning Outsiders program came under fire in July for inappropriate comments by Senator David Leyonhjelm towards his colleague, Sarah Hanson Young. A statement from outgoing CEO Angelos Frangopoulos said the Adam Giles Show would go into “recess”, as it looked to “implement new processes and review the production format and structure”. He also said Cottrell would not return to the channel. “Sky News has investigated the editorial processes in relation to an interview broadcast on Sunday evening,” Frangopoulos said. As part of the review, Sky News has appointed Greg Byrnes as acting program director and Kaycie Bradford as acting news director. “The Sky News editorial leadership team will ensure the production of weekend programs and guest appearances meet editorial, journalistic and community expectations,” he added. Sky News’ action follows a day’s worth of outrage, which stemmed from the interview. On Sunday night, Sky News Australia released a statement by Greg Byrnes, news director, who admitted it was “wrong” to have Cottrell on the channel. The interview also resulted with the resignation of former Australian Labor Party politician, Craig Emerson, who said the interview attempted to normalise racism and bigotry. The right thing to do by Sky News, but too late. He already has the publicity and censorship story he wants. I lost 48 of my parent’s immediate family of 50 to the Nazis. 6 million Jews were killed. Hundreds of thousands of decent Americans, Brits, Canadians and Anzacs were tragically killed in the same war.Millions more were victims in other countries. Good for you, Victor. Could you please let me have Robert’s and your email addresses. I have a photo for you. Michael. More left wing beat up of a interview for which Sky has apologised for unlike several other media organisations that interviewed the guy in the past including the ABC. Move on. I really worry about denying people like Cottrell places to air their views – no matter how obnoxious. If we don’t give them air time or space, how do we know what they are saying? And why do we then deny ourselves the opportunity to counter those views and slay their ideas with facts and evidence? Had it not been for SkyNews I would never had heard of this guy and his really alarming views. But I am glad I now know what he thinks because he has made me think of how we would counter such extreme opinions as these. Pretending these people don’t exist is not the answer. I understand your reticence John. It is an issue I have wrestled with for ages. Extremist views are like fires. If you do give them oxygen they will burn you every time. Therefore, I err on the side of caution of extinguishing something that is so potentially dangerous as Victor Grynberg points out. As for Pete … I just feel sorry for you. No one is pretending Cottrell doesn’t exist. It’s simply an editorial decision (or should have been) that his views add nothing meaningful to the public discourse and are not worthy of air-time. There is no such thing as a legitimate public debate about whether people of all races, religions, genders, and sexual orientations are entitled to life, dignity and basic human rights. Attempting to debate people’s humanity is a waste of air-time and should be treated as such. We don’t waste air-time or column inches debating self-evident truths. But we are talking about Newscorp here. The company has built an empire by inflaming prejudices, selling click bait, and inciting outrage however it can. I come down very firmly in the “no platform for Nazis” camp, but Sky News could have had some mitigation if they’d introduced this guy with some background, not just “activist”. It would’ve taken about 30 seconds of research. Well said Joan. The last thing we want is a network that behaves like Fox News in the US here in Australia. Fox News divides the community and covers news with a hard right editorial line to add salt to the wounds that pass for political debate. Its heartening to see so many people responding to Cottrell’s interview and forcing a change of tack from Sky. I have personally contacted advertisers like Luxury Escapes to thank them for pulling their sponsorship of this platform for hate speech. Its time Sky got their editorial act together and covered the news with journalistic integrity. This is complete BS… the 2 “new” directors already have jobs and will continue to hold them. This is simply a case of dishing out some new titles to make it look like something is being done. At the very heart of the problem is a lack of senior, experienced staff with the ability to make the right call (one or two good people are not enough). This is the legacy of a deliberate policy of under resourcing that’s come home to roost after years in play.